John Francis Hamtramck was born on April 19, 1798 at Fort Wayne, Indiana. His father, Colonel John Francis Hamtramck, was commandant of Fort Wayne and a life-long soldier with a very distinguished career. Upon the death of his father in 1803, young John Francis Hamtramck became the ward of General William Henry Harrison. Due to the influence of General Harrison, Hamtramck received an appointment to the U.S. Military Academy. He entered in September of 1815 and graduated in July 1819. He was promoted to 2nd Lieutenant and assigned to the Corps of Artillery in July of that year. His first post was at Fort Mifflin in Pennsylvania where he served through 1820. On June 1, 1821 Hamtramck was re-assigned to the 3rd Artillery Corps. He resigned his commission in March 1822. Upon leaving the army, Hamtramck took up residence near St. Louis, Missouri, where he owned and ran a farm. It is unclear why, but in the summer of 1825 Hamtramck was “at a ball” in Shepherdstown at the home of Walter Bowie Selby where he met and fell in love with Eliza Clagett Selby, Selby’s oldest daughter. They were married on December 27, 1825 and returned to St. Louis. In May 1826 he was appointed the U.S. Indian Agent for the Osage Tribe and remained in that position until July 1830. When Hamtramck was replaced as Indian agent, his wife Eliza exerted her influence and persuaded her husband to return to Jefferson County. The Hamtramcks bought a farm just east of Alexander Boteler’s Fountain Rock, but lived in the Selby home (Wynkoop’s Tavern) on East German Street. Hamtramck was immersed in Shepherdstown life. He was mayor of Shepherdstown from 1850 to 1854, and from 1853 to 1858 served on the Jefferson County Court. Due to his military background, Hamtramck served as captain of both the Potomac Rifle Company and the Shepherdstown Light Infantry. 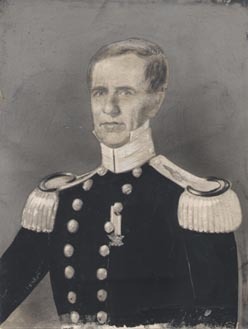 During the Mexican War, Virginia Governor William Smith appointed Hamtramck Colonel of the 1st Virginia Volunteer Regiment. John Francis Hamtramck died at his home in Shepherdstown on April 21st, 1858. He was buried in Elmwood Cemetery. On April 27th at a special meeting the men and officers renamed the Shepherdstown Light Infantry the Hamtramck Guards in honor and respect of their former captain. Military man; Mayor of Shepherdstown 1850-1854; served on the Jefferson County Court 1853-1858. Used with permission from the West Virginia State Archives.